Following the release of the acclaimed A Silent Voice this year, new anime fans may be looking at the backlist of the studio which made it, Kyoto Animation. They may be surprised to find it had a very different reputation before Voice. Its early TV serials often played with “slice of life” formats, where any continuing story took a back seat to everyday trivia; shows like 2007’s Lucky Star and 2010’s K-ON! But you could see these shows as foundations, giving Kyoto Animation the confidence to tell more substantial stories in unusual ways. Hyouka, which Kyoto Animation made two years after K-ON!, is an excellent example. Many fans see it as a mix between a high-school slice-of-lifer and… a mystery series. The main character is a boy, Hotaro, who’s determined to live a passive, uneventful school life. However, one person he can’t seem to ignore is his big sister (away from home) who sends a letter asking Hotaro to join the school’s moribund Classic Literature Club. Figuring he’ll be the only member, Hotaro strolls over to the clubroom – to find a girl his age already there: Eru, who’s joining for “personal” reasons. What happens next seems to be the most trivial thing in the world. When Hotaro entered the clubroom, he needed to unlock the door – even though Eru was inside and she claims the room wasn’t locked. It’s a minor but niggling puzzle suffused with curiosity… and which Hotaro solves in moments. From that point on, Eru is imploring him to solve other mysteries, some extremely trivial and others that have much deeper meanings. From a ghost in a hotel to an unfinished amateur film, Hotaro’s and Eru’s miniature detective agency is on the case. The duo soon becomes a quartet, as two more students join the club: Hotaro’s carefree-seeming male friend Satoshi, and the comically imperious girl Mayaka. 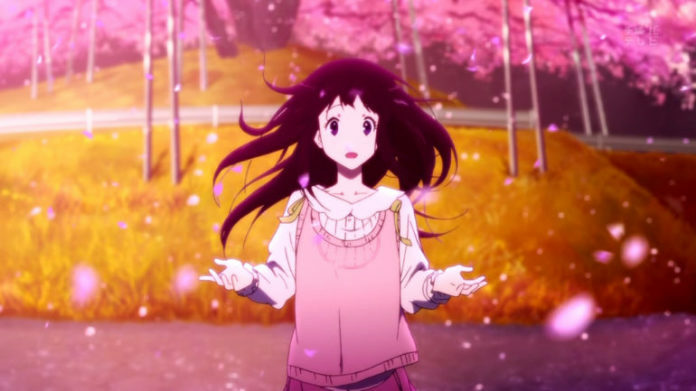 The first thing to highlight is how stunningly beautiful Hyouka is. The quality and humanity of the character animation is astounding. If you’re a fan of sakuga animation, you’ll seldom find it sustained with such delicacy and charm. Or, as I put it in a Neo magazine review, Hyouka! shows the characters’ “theatrical exclamations and humphs, their shy blinks, their glances away giving everything away,” and all of this in “a liquid tapestry, hypnotic to watch.” The lessons learned by Kyoto Animation from the moe minutiae of shows like K-ON!, built on similarly small interactions, have been learned well. Hyouka’s town scenery is also gorgeous; you could forgivably mistake the setting for Kyoto itself, but it’s actually a fictional town modelled on Takayama. Looking past the specific “KyoAni” style, Hyouka is the relative of an anime film that was made very differently, but also focused on small character nuances; The Case of Hana and Alice. Both anime use “mystery” plots to provide a structure to interest the audience, even while the stories are really about the characters’ relationships, which evolve through the puzzle-solving. In Hyouka, Hotaro’s languidly detached attitude might seem fitting for a “great detective” character. However, it starts to look more and more like a childish affectation, what Japanese people would call chunibyo or middle-school syndrome. Coincidentally, the same year that Kyoto Animation was making Hyouka, it also made a whole series on that very subject: Love, Chunibyo and Other Delusions. 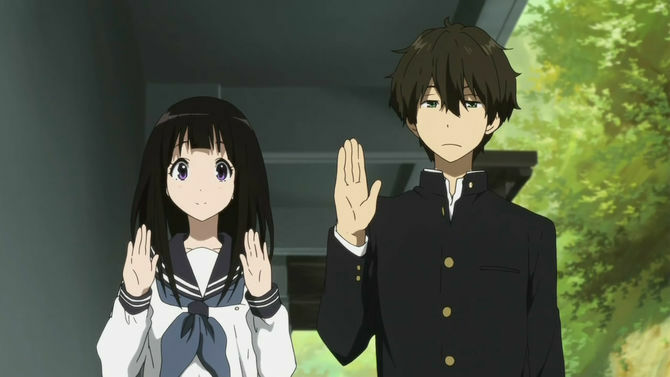 Later episodes become a reflection on the whole thriller genre, as the Hyouka characters must deduce the ending of an unfinished student movie, a murder mystery. British viewers may think of the efforts to solve Charles Dickens’ unfinished mystery Edwin Drood; there’s also a famous TV episode of Hancock’s Half Hour where the characters are maddened by a mystery novel whose last page is missing. As they try to work out the end of the story, Hyouka’s characters earnestly discuss the differences between Sherlock Holmes mysteries and those by Agatha Christie. Did you notice, for example, that no Holmes story has a twist like that in Murder on the Orient Express? Japan, of course, loves its mystery tales. We’ve discussed Sherlock’s fame in Japan on this blog, but Christie’s titanic, too; there’s a great piece on Christie in Japan online, and Poirot and Marple are part of anime, courtesy of a 2004 series on NHK. Even by anime standards, KyoAni and its staff seem exceptionally adaptable. Naoko Yamada, perhaps the studio’s best-known director, handled both the feather-light K-ON! and the intense Silent Voice. Hyouta’s male director is Yasuhiro Takemoto, who’s worked across Full Metal Panic! (the later series), Lucky Star! and Haruhi Suzumiya. Since Hyouka, he’s also directed two fantastical comedies, Amagi Brilliant Park and Miss Kobayashi’s Dragon’s Maid. Building on the past, unbound by tradition, KyoAni’s artists look ready for anything. Hyouka, part one, is available in the UK from Anime Limited. Disappointed you missed out the “The Holy Trinity’ of Kyoto Animation” – Air, Cannon and Clannad. Clannad being in top 2 of my favourite shows. Then again they have done A LOT of good shows though!